Ritu Bhardawaj is an Indian TV reporter who has broken through the silk ceiling which narrows the prospects for so many women in the Asia Pacific region. In New Delhi, Ritu Bhardawaj is a star to the neighborhood children. Not only does she help with their homework, but she's also a glamorous TV reporter. For young Indian girls like Kiran and Monika, she's a role model in a society that doesn't favor ambitious girls. We follow Ritu as she makes her next big report - a documentary about the "silk ceiling" which hangs over the lives of many women in the Asia Pacific region, narrowing prospects and frustrating talent. Do politics and the law mean they're all fighting against impossible odds? 8. How to Become a President - Former World Soccer Player of the Year, George Weah, is running for president again his native Liberia. Is he out of his depth? "There is a continuous challenge of trying to strike a balance in the film[s]...[The films] can be used successfully in stimulating a discussion amongst the youth about the negative aspects of such a life as well as an exploration of alternatives." Includes full accessibility through closed captions for the hard-of-hearing and verbal descriptions for the visually impaired. A low-caste Hindu, Shakuntala Kazmi fights for women's rights. Micro-credit is transforming the lives of women in Bangladesh. Six short films about women and development by local women directors. Looks at the obstacles facing working mothers and families and the employer and public policy changes needed to restore work-life balance. Examines progress in women's rights globally. A clandestinely shot, deep-access account of how the clothes we buy are actually made. 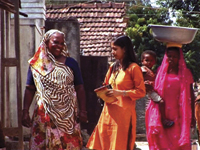 Literacy program spurs anti-liquor campaign in rural India and empowers women. There is nothing innate in patriarchy and militarism. We can change our culture. International efforts to assure reproductive health and rights conflict with cultural realities in the Philippines, Latvia, Japan, and India. Explores the international movement for women's rights. Literacy and access to health services slow population growth in India.